This is a mechanical Vermin Lord, created as a way to give new life to an avatar of the Great Horned Rat through a combination of daemonic power and Skaven ingenuity. Warlock Krosscut looked on with resignation as a group of his Skaven survivors – all that remained of his army – attempted to tie their tails together. This was an old superstition – the rattendaemon – and it was said that the more tails that were entwined, the wiser the participants would become, until they became so strong and wise as to be unto the daemon-kind. His clan were desperate, they were looking for any answer, even in such foolishness – long, long since disproven through the vigourous application of scientific experiment. The warlock scowled. The great race of Skaven had never achieved anything by looking backwards. Their strength, their superiority over all other races in the Nine Realms, came from a unique ability to look to the future! He believed this with all of his shrivelled black heart: if there were answers to be found in this place, then the science and inventiveness of the Skaven-kind would provide them. And he would lead his ratmen from this cursed swamp, standing astride ingenious and terrible engines! This tail-tying stuff was an embarrassment. Krosscut had seen the immense Parasite Engines in the Realm of Life with his own eyes, and he knew first hand what Skaven ingenuity could achieve if only leaders such as himself had imagination and ambition. There must be imagination of course, what a precious commodity! And hard work – this went without saying, and self-sacrifice and… His whiskers twitched as he mentally corrected himself: not his self-sacrifice, but the self-sacrifice of other, less competent Skaven – or was that just sacrifice? There were those whose part in the great works to come would not be that of the visionary – he mused as he watched his brothers and sisters scrabbling around desperately in the black mud – some Skaven lacked the perspicacity and the sheer head-pounding, skull-cracking volume of ideas – what good was one idea? Any fool could have one idea. An orphan idea was a weak thing – strength came from numbers! His head felt full to bursting with half-completed schematics and designs – if only he had the time, and some capable assistants. Not all Skaven had his resourcefulness, he knew this, but there was a place for the others: they were all cogs in the great machine. With a growing sense of despair he watched as five Clanrats, their tails now successfully bound together with leather straps, sunk slowly into the swamp with a thrashing of claws and increasingly terrified, wailing shrieks. Each was trying to escape in a different direction, and each only succeeding in dragging the others further in. The last, wild-eyed rat sunk beneath the dark, impenetrable water and after a while the surface of the swamp became still once again. The Skaven nearby that had paused to watch the spectacle resumed tying their tails together, though some were now rethinking the leather straps and were instead giving careful consideration to the benefits using heavy iron nails. He sighed, and scratched his nose without conviction. Perhaps not all were suited to be cogs, he revised his theory: it was inevitable that some were destined only to lubricate the cogs of the great machine with their useless, greasy bodies. He risked another glance at the great skull, the enormous, judgemental, terrifying rat skull that was all that remained of the Vermin Lord Ner’tithixis. The empty eye sockets seemed to be watching him, evaluating him. He had dragged the skull with his own two paws through waist deep mud and over the broken, dead ground of this cursed place. Even when all his more shameful instincts had screamed at him to run and hide, to abandon it and let it sink, he had persevered. There was power left inside it, he knew this with certainty. Whatever had happened when Ner’thithixis had been struck down by those lightning-wreathed hammers, it had not been death. Death seemed… indecisive in this swamp, its touch uncertain and confused, far from the absolute he had generally regarded it as. He had seen strange things, unscientific things. He had seen a Stormvermin, shot through with the rotten black arrows of the aelves, but who refused to die even when he could no longer walk for all the barbs that pierced him. And the aelves themselves – were they even truly alive at all? He began composing a series of tests that would help him ascertain this, for when they managed to obtain a viable subject. His ears pricked up as he heard the call he had been waiting for: a weak, sputtering trumpet, blown twice. As the signifier of such a momentous moment, the sound was underwhelming, but it meant that the scavenging party had returned, and with them, he most feverently hoped, would be the raw materials he needed to finally complete his great project. The timber had been a challenge, because everything in the swamp was rotten and useless, but the other components were coming together with surprising ease. Of course, it helped that most of his clan was dead, and their war engines lay scattered and abandoned nearby, full of precious materials and devices that the aelves had no understanding of – backwards-looking fools! Krosscut could feel the Vermin Lord skull urging him to increase his efforts and he threw up his hands in an expression that he hoped communicated his absolute desire to obey if only his assistants could aspire to be more than lubrication. The daemonkind – the great Vermin Lords – were wise, wise even beyond his understanding. They were not builders or inventors, which was a pity, but they were leaders and they were so strong, particularly – he theorised- if their vulnerable flesh and surprisingly-easily-pulverised bones were replaced with unbreakable iron and bronze. Ner’tithixis would know a way from this swamp, Krosscut was sure of it. And Ner’tithixis – the true rattendaemon – would soon walk again. This model is created using a Forge World Cerastus Knight-Lancer as a base, but includes a multitude of other parts, such as the boat that was part of the base from the Merwyrm kit, and a real rat skull (although just a cast of a rat skull, I chickened out about using the real thing). 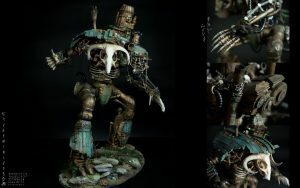 The arms are largely cobbled together from parts of a plagueclaw catapult and pistons from a Legion of Azgorh Skullcracker, which also provides some of the other mechanical parts. I figured if I could introduce enough archaic looking technology in prominent places – such as the boiler – it would distract from the futuristic design of the Knight kit. I also disguised the Knight where possible with low-tech ropes, cogs and wooden planks. The red and black splodges are textured paint, I realise they make my WIP images look like I have begun painting them using my fingers. My favourite thing about Age of Sigmar is that it makes conversions like this possible. Although arguably the Rattendaemon would have worked in the Old World, it would have felt like an intrusion, like the world was a carefully crafted place where giant robot Skaven need to be gently introduced if they are going to work at all. Towards the end of the Old World we began to see this problem, the giant kits that were introduced felt too big for the otherwise quite small scale of the world. Age of Sigmar is more like 40k – if you can imagine it, then there is a place for it. It’s not just about High Fantasy vs Low Fantasy, rather it is about freedom, and breaking away from conventions. This is why I love Age of Sigmar. Also I have finally discovered a love for Skaven. Never got into them in the Old World particularly because they felt like they were constrained by their opponents – fighting Dwarves in tunnels made them something of a fantasy cliche by association. But in Age of Sigmar with their Parasite Engines – giant walking cities of Skaven – they feel like they are free to do their own thing. Incidentally I think this model would work fine in 40k, particularly in the cool Outgard setting. And I think to my mind at least there is a sort of meta-setting, just called Warhammer, where Skaven and Space Marines all exist together. Gads that is pure genius. So many parts to entrap the imagination. I love this conversion. Bravo good sir!! Cheers! I do try to use some unusual parts where possible. This model all came together quite easily once I had the two or three main kits in hand. If monstrosities like this are a conscuence of the End Times it might almost have been worth it! It has been a bit of a wait. I’ve been working on huge projects like this one, on and off over Summer. I have quite a lot of other figures nearing completion. Fantastic stuff – very innovative and yet neatly capturing the Skaven aethetic. To me freedom and breaking from conventions is at the heart of what makes this hobby great, regardless of setting. Really enjoyed the piece of accompanying fiction as well. Thanks. I didn’t actually have a single Skaven bit, so I was worried it wouldn’t fit the Skaven aesthetic – particularly as it is a 40 model and in very non-Skaven colours. Luckily, AoS gives a bit more freedom – now Skaven are aligned with Chaos and there are far more options for coming up with your own clans etc. It’s interesting that you say that; I always like having a bit of a framework – even if I only use it as a jumping off point to do my own thing with. I’ve always worked in my own, fairly warped, interpretation of the Warhammer/40k universes anyway. For me the AoS universe is still a little paralysing, it offers so much freedom that I don’t have a structure of ideas to build on. In part it’s because I haven’t really got to grips with the AoS universe yet, most of my knowledge is still based around the Warhammer old world and I was already doing my own spin on that to begin with. I am hopeful though that as people start to accept the change to AoS the less restrictive environment might encourage them to let their hair down and enjoy the increased creative freedom it potentially offers. As your own example demonstrates there’s plenty of options to do some really inventive things and if AoS was what was required to give people that push them I’m all for it. I can see why you might think that way – about the paralysing effect. But my theory is that with the Realms, you can pretty much just grab a bit, give it whatever rules you like, change a bit of a lore if it doesn’t sit right with you, and so forth. I found the Old World more paralysing because I was constantly having to check if my ideas would fit in, either logically or consistently with the established lore, or whatever. It doesn’t hurt to get a bit of background on AoS, but there isn’t a whole lot, and you can certainly define your own little corner somewhere. Great model Jake. Also luv reading your text, think you should write some stories! Thanks, I like writing the stories on this site, but so far Black Library don’t want me. Skaven are good fun to write it turns out. Before AoS I had plans to make my own corner of the Old World – a distant island or magical realm where I could add bizarre creatures to my heart’s content. But even then it would be tricky to think of a reason why certain armies would ever encounter each other. AoS solved all that. Awsome work as always! That’s one of the things I love about AoS. The freedom to do whatever you want really, in the same vein as 40k. I would love to see Krosscut actually, as he sounds like a really great character! Thanks! I do have quite a few plans for some unusual Skaven, but they will have to wait for a bit. Next up is the people that are hunting this guy. Wow , love the wood and orange and tuqoise pallet . A real snse of restrained exuberance , and carefully articulated modelling . So glad you didn’t use such a brittle thing as a real skull! Incredible work, it’s surprising that crossing franchises like this CAN work backwards; an IK in AoS, fancy that! You really are master to learn from. Yeah, I think that AoS just gives that extra bit of freedom – I might have had to think twice about an IK in the Old World. I love Skaven in AoS, in fact I feel like they were the first AoS race – something different from Tolkien’s template, with their steampunky technology and machinery. Plus their grimdark aesthetic combines with a potential for black humour – they are basically a 40k race… or to be more accurate, they are a real Games Workshop invention. I hope that AoS sees them flourish, and maybe some other races will also realise their potential. Great work Jake! I like your thinking about AOS and your idea about Warhammer. . . This is just the sort of creation which would fit in brilliantly in my new project, The Planet Null. . . My vision is a world where the AOS and 40k worlds are blurred together, where magiks compete with technology and the stranger the characters the better. . . Thanks Gabe. The the thing about old Fantasy was that The Old World could easily have existed as a remote world in Warhammer 40k, maybe lost in the Eye of Terror. AoS doesn’t seem like it would fit into 40k – it feels too epic and expansive to merely be a hidden corner of somewhere else. But what doesn’t work in one setting will likely work in the other, AoS and 40k are like two halves of a science fiction puzzle, and I am sure there is lots of room for cross over too – eg. this model of mine could work in either universe. Anyway I guess my point is that unless the setting brings something new, why not incorporate it into either 40k or AoS? Particularly AoS could use an injection of some crazy creativity from hobbyists I think, it’s a vast sandbox that is ready to be explored. Unless you want a literal crossover, with Stormcast vs. Space Marines of course.